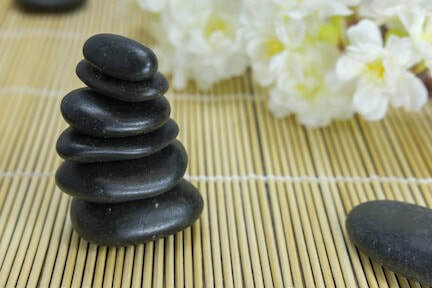 Kirby learned a unique and potent version of Hot Stones Massage from a lineage in Colorado, taught by a Native American Shaman. This incredible modality is becoming one of Kirby's specialties and it can benefit a whole range of issues (see below). The shaman who taught us how to work with the medicine in the stones has a very unusual background story. It turns out that when he was 5 years old, he started speaking in tongues (it was actually a language but no one knew what he was saying). His parents determined that he was not under supernatural influence and eventually they took him to various linguists. It took over a year to discover that he was speaking an indigenous American language and then it took another year of visiting tribal councils and elders. They were about to give up hope when they met with a wizened Cherokee grandmother who had the child speak in the foreign language to her - she said, "that is in fact a dialect of Cherokee - but it hasn't been spoken in over 150 years." Wow! Using information that the child knew (without ever hearing the Cherokee oral history), the elders discerned that the child was the reincarnation of a famous Cherokee medicine man from over 300 years ago. By the time he was 12, he was learning the ways of the traditional medicine people. He had done numerous vision quests by the time he was 18, and when he turned 21, he started taking on students. 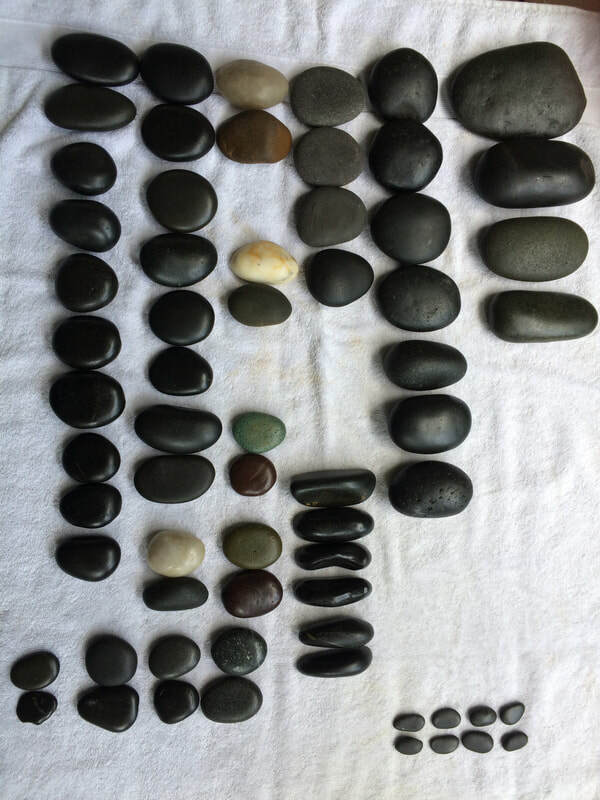 The Shaman learned the traditional way of working with Hot Stones - the La Stones technique. He became a teacher for that system for a couple years, but he kept hearing the stones tell him, "We have medicine to offer that is not being used." So he worked with the stones on his own for a year and learned a modification of what he originally learned. What he teaches now works with the meridians from Chinese Medicine. There are specific tapping sequences which work with various issues - including sexual frigidity, back issues, digestive issues, urogenital problems, neck pain and headaches and more. By the way, if you google the Shaman's name (I will tell you in person), all you will find is his jewelry site. He is very modest and down to earth - he is a strict teacher and he does not broadcast his special insights or teachings. I feel this legitimizes his spiritual teachings / prowess. 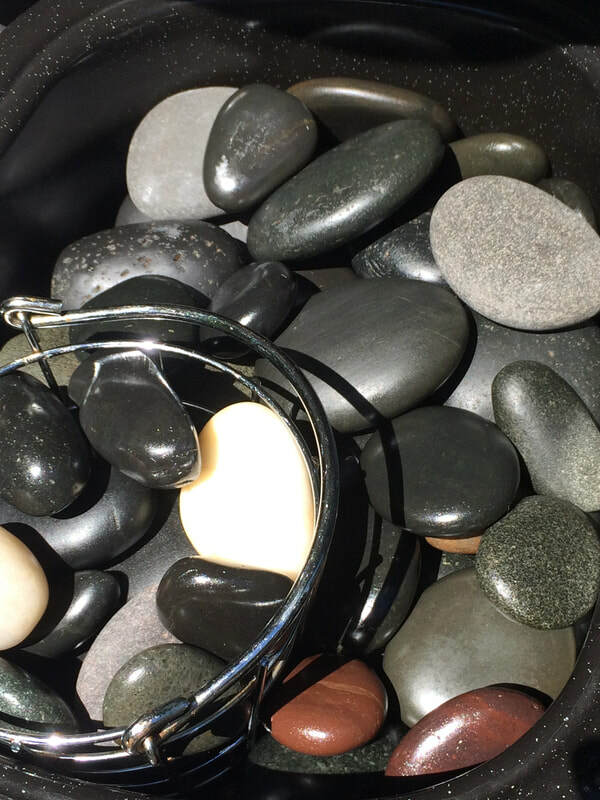 This is the Hot Stones modality we learned in massage school in Colorado. And now Hot Stones is becoming one of Kirby's specialties!